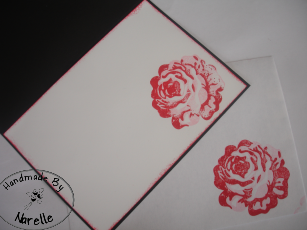 I have used Rose Red as my base colour and then used Flirtatious specialty paper and a strip of So Saffron paper stack as my patterned paper. 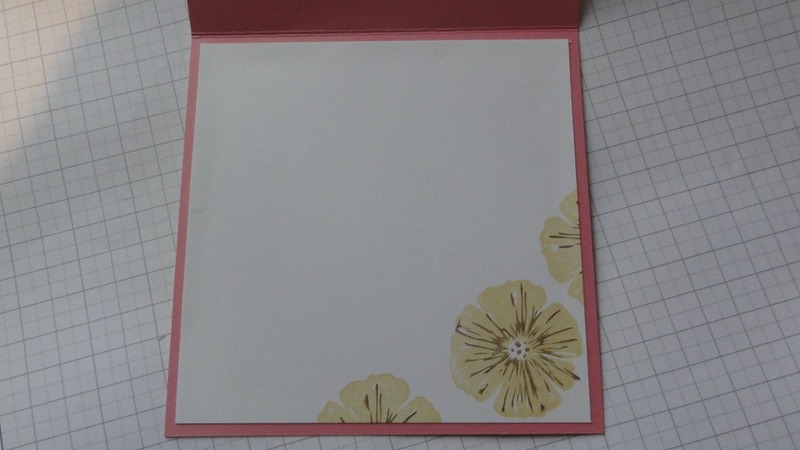 For the stamp set I have used Greenhouse Garden in So Saffron and Soft Suede I got my colour combo from the Colour Coach. I have added some thread around the front and added two little tags to finish off the sentiment I had a bit of trouble finding these words small enough to fit in the tag and also most sayings, seem to say “for you”, not “to you”. Anyway I found this one on the stamp set Under the Big Top. I used my markers to ink up only these two words, then punched it out. For the 3-D flower I cut out 4 more flowers and sprayed them with water and scrunched them up. I used a brad for the centre. It is a very windy day outside today and from what I hear a lot of NZ has had snow this morning, very exciting for them. 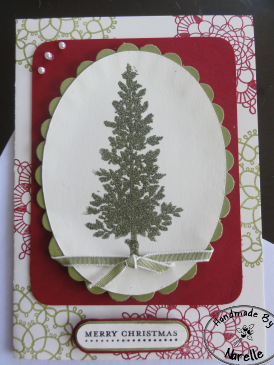 For today’s card I have done a sketch challenge for Try Stampin’ On Tuesday. 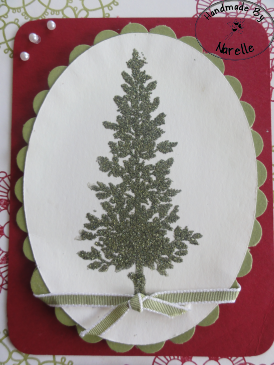 At first I had no idea what I would do and then I thought why not use one of my new stamp sets (to be released on September 1st) and use my heat and stick powder with some beautiful glitter that I have had for a while now but have not used it. I love the out come and no this is not my first Christmas card for the year, but I can’t show you the other one just yet. I have used my border punch around the outside of the oval and cut nicks in it so I could bend it around the oval. 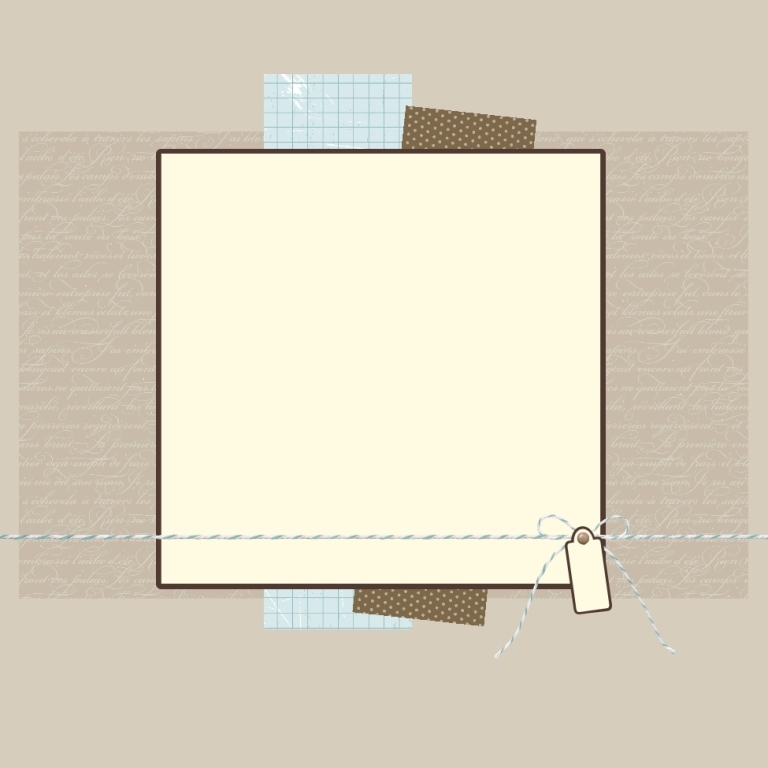 Now before you see the card, some of you may think this is not a sneak peek as I’m showing you the whole card, but I figured since you cant see the whole images I can call it a sneak peek. 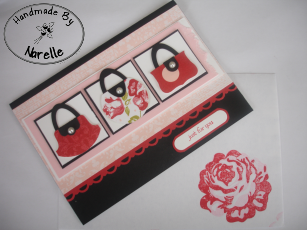 Good afternoon, today is just a quick post to say I made the top three again this week at Try Stampin on Tuesday, that’s four in a row now. (no pressure right) So here is my badge. 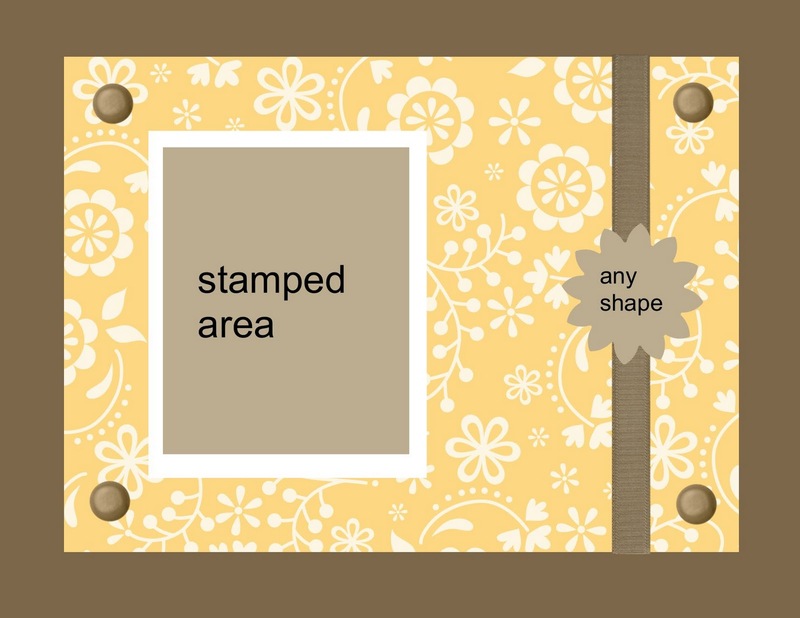 And just a quick note, for every time you enter a challenge here you go in the draw to win something from Stampin up once a month. Today was my lucky day and I won this months draw. can’t wait to see what I get. and just to remind you what card I entered. Tomorrow I hope to blog one of the cards we made at Jacques house on Monday night, We made two and both are using products from the new mini out. Good morning, its very early here, but the kids are up and the day has started. 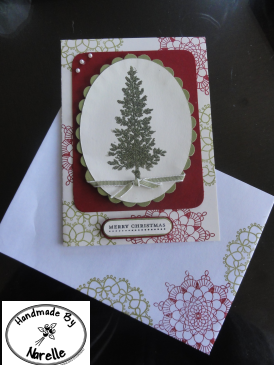 Today I have this weeks Try Stampin On Tuesday challenge. It is very similar to one we had a few weeks ago, but that’s ok it was fun. 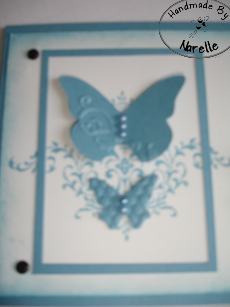 For this card I have only used a couple of colours, white, Marina Mist and a touch of black. Isn’t that Marina Mist a stunning colour. I have used black for the brads and sentiment. I changed the sketch slightly but that is because the sentiment just didn’t fit above the ribbon bow. Other than that nothing is different. 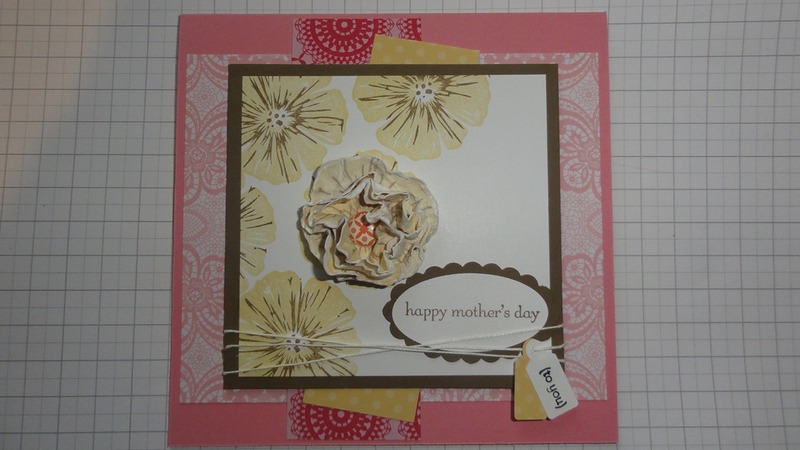 I have used a picture stamp over the sentiment and sponged all the edges as a finishing touch. 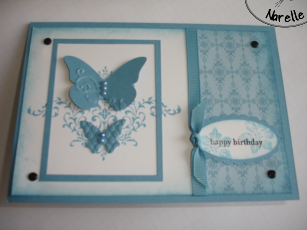 I love sponging and not many of my cards finish without any on them. I did take a photo of the inside but the photo didn’t turn out so I will post that later. Good evening, it has been one very hot day today, although it did start out as a miserable foggy morning. We even had some rain so the saying four seasons in one day really fits today. My husband arrived home nice and early tonight and gave me a lovely red rose wrapped in a gorgeous red material, the funny thing is I had also been to the same shop and brought the same red rose for him. the only difference is he brought one in a lovely vase. I managed to make time today to make my husband a valentines card, and since this weeks theme for Just Add Ink is Just Add Love then this fits perfectly. 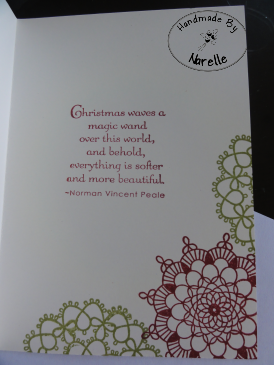 I have stamped on the background of the Pear Pizzazz with the same colour to give it body with the new Bliss stamp set. 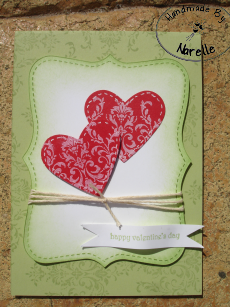 I have also stamped on the hearts with the same set but in white. I have stitched the edge of the hearts to finish them off. I have sponged with pear pizzazz on the Top Note Die to blend into the background. 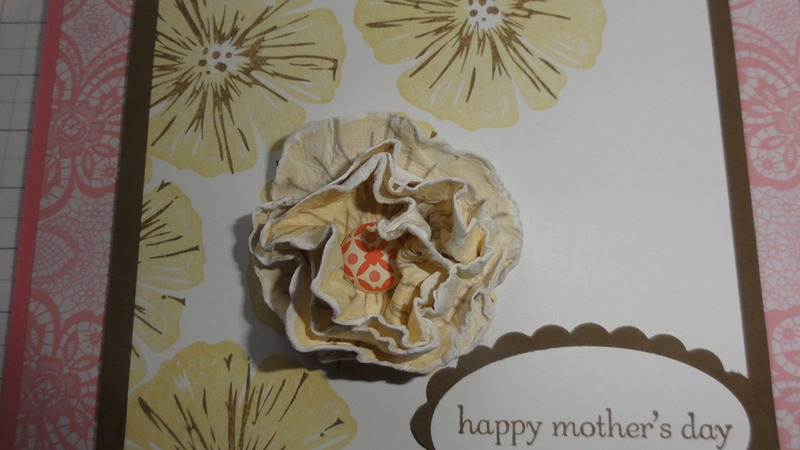 The sentiment is from Teeny Tiny Sentiments and I have used twine to finish it off. First of all, my heart goes out to anyone who knows of the men or their family down in the mine, it’s a real sad time here in New Zealand. Wow it has been nearly a week since I last posted, sorry about that it has been a very busy few weeks and one day just rolls into the next. On an exciting note we are finally getting our back yard started tomorrow, we have a terrible slope and we are putting in a retaining wall to try and get some of that land back. we are also having our front yard dug out too. I have been waiting for over a year for this to happen so in a way it’s really exciting and in a way I don’t want to get too excited in case it doesn’t happen. I do have to say I have a new builder doing it and he is great, excellent with communication and really enthusiastic about what we can do. 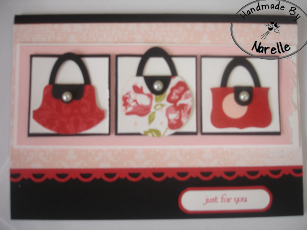 For todays post I have a card I made in a class with Jacque but I have re-designed it a bit. 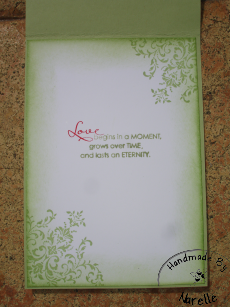 I have used the DSP Bella Rose (retired) I love this paper. the hand bags are made from punches and so is the handle and buckles. I have given the right hand side a torn effect just to be different. 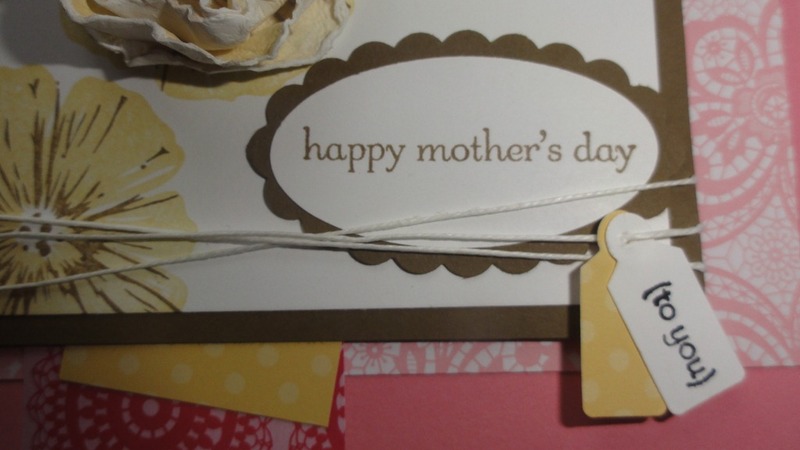 You know what I have just realised apart from the sentiment on the front and a little picture in the centre there is no stamping on this card. I have added this photo because the first one is a bit blurry. 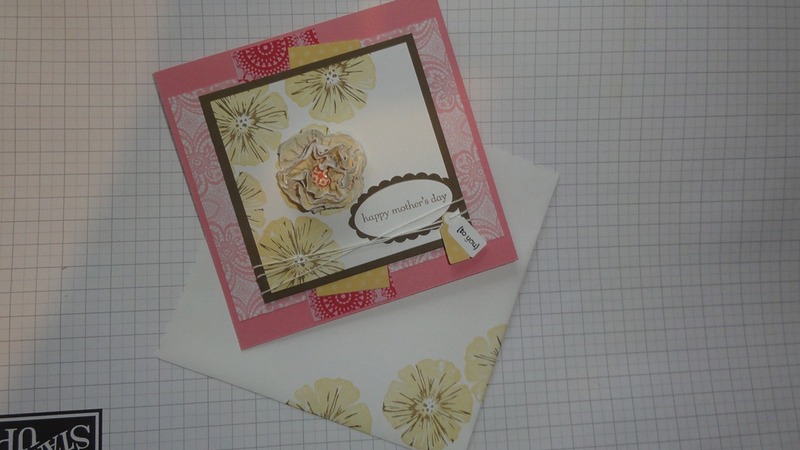 Punches – Round Tab, Curly Label, 1 3/8 Circle Punch, Word Window, small Oval, Wide Oval, Scallop Border, Corner Punch.